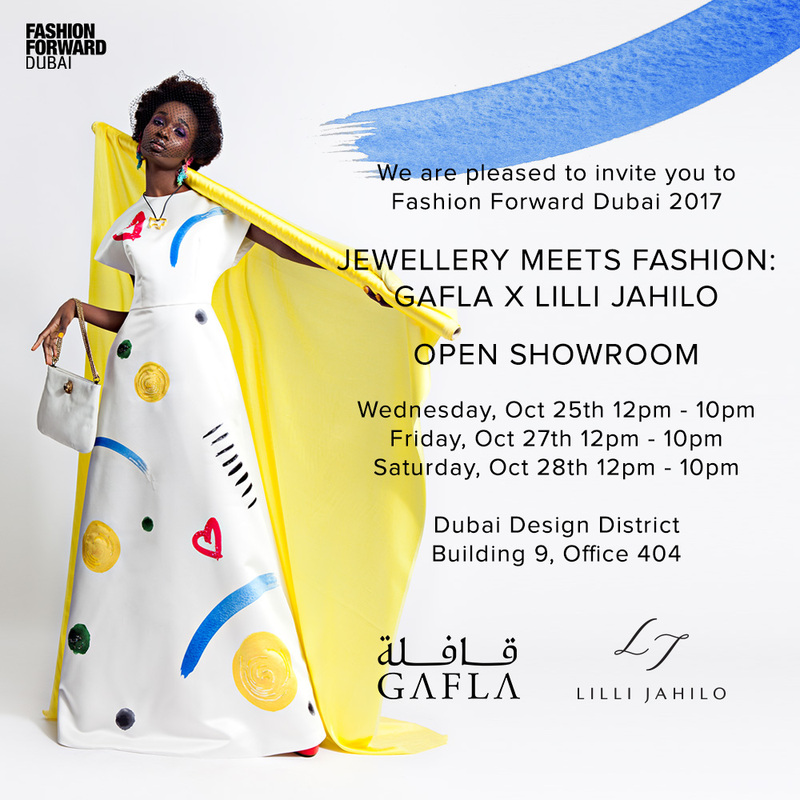 Gafla Jewellery and Lilli Jahilo have announced that they will hold a unique exhibition showcasing exquisite fine jewels alongside dresses from the latest ‘The Art Collection II’ line at Fashion Forward Dubai (FFWD). FFWD is returning for its tenth season and October’s event will see Gafla open the doors of its new showroom in the Dubai Design District, d3, for the jewellery and fashion collaboration. The exhibition runs from Wednesday 25th to Saturday 28th October where visitors can experience and try on a dazzling array of jewels and elegant dresses. A press and VIP event will take place on Thursday 26th October where three presentations encompassing 10 jewellery and fashion looks will take place over the day. The collaboration is the latest event in d3’s exciting calendar that is seeing a growing blend of jewellery, design and fashion initiatives. As one of the leading jewellery houses in the region, Gafla is playing a prominent role in this movement with a number of key exhibitions showcasing their latest collections. Gafla Co-founder Bushra bint Darwish says of the event: “We are extremely excited to be working alongside the wonderfully talented Lilli Jahilo for the four day event and being part of Fashion Forward for the first time ever. Gafla is a fine jewellery brand based in Dubai specialising in contemporary designs inspired by the rich history of the Gulf. Launched in 2015, Gafla’s founders Hamad bin Shaiban, Abdulla BelJafla and Bushra bint Darwish came together with a shared passion for their Emirati heritage and the role this can play in cutting edge modern jewellery design. Today Gafla presents the collections from its showroom in the heart of the Dubai Design District, d3, with pieces also available at Robinsons Festival City. Every design is handmade using only the finest diamonds and gemstones, creating unique and stunning jewels for the international collector. Lilli Jahilo is an award-winning nouveau niche designer. Trained at the famous Chanel Atelier Lesage in Paris, her signature style is uniquely feminine, blending Scandinavian minimalism with expressive colors and the technique of haute couture. Maison Lilli Jahilo was founded in 2010 and it caters to clients around the world with main markets in Scandinavia, the Benelux countries, UK and the UAE. Lilli Jahilo focuses on dresses that are designed to empower the modern woman, with all garments produced responsibly. The brand maintains the highest levels of craftsmanship at all levels — including design, fabric selection and the best tailors employed in-house. Lilli Jahilo has won a number of awards over her career, including the Designer of the Year Award ‘The Golden Needle’ 2016 and People’s Choice Award at the Estonian Fashion Designer of the Year Awards 2015. Fashion Forward Dubai (FFWD) is the largest fashion event and most definitive platform in the Middle East endorsed by the Dubai Design and Fashion Council (DDFC) and presented by Dubai Design District. Hosted bi-annually, FFWD presents the region’s established and emerging talent in couture, read-to-wear, jewellery and accessories through fashion shows, presentations and exhibitions. Its mission is to act as a catalyst in developing the fashion industry in the Middle East, by helping transform our regional talent into global brands and to contribute towards the positioning of Dubai as a leading international fashion hub.